Task-Killer Apps: Will They Help or Hurt Your Battery Life? iPhone 4S Battery Life: How Does It Compare to Other Smartphones? If you have an Android phone, you’re probably dissatisfied with its battery life. After all, many phones, especially 4G models, can’t make it through the day without needing to sip from a power outlet. Some frustrated Android users turn to task managers such as Advanced Task Killer to preserve the handset's juice. The theory makes sense: Apps for Facebook, Google Maps, Pandora, and Twitter, for instance, love to start up in the background. If you automatically and regularly stop such apps, the thinking goes, you’ll end up with longer battery life. But for everyone who advocates a task killer, there’s another Android user who claims that such tools actually decrease battery life. Their argument: Apps that start up in the background will just restart themselves after an app killer stops them. And all that activity--the app killer stopping processes, and the apps starting themselves up again--will knock bars off your battery meter. In the PCWorld Labs, we hate unanswered questions. So we tested an app killer on a variety of phones. Our results indicate that neither side is entirely right. Overall, using an app killer produced an increase in battery life, but one so small that most people wouldn’t notice it. And on a couple of phones, battery life remained unchanged, or decreased, with an app killer on the job. The phones we chose for the testing were the HTC Evo 3D, the HTC Sensation 4G, the HTC ThunderBolt, the Motorola Droid Bionic, and the AT&T Samsung Galaxy S II. We reset each phone to factory settings, with Wi-Fi disabled and 4G on. We set the phones to play a high-def movie on a loop, with the screen at maximum brightness, until the phone battery died. 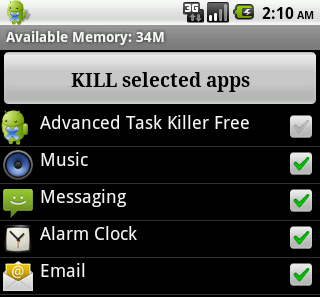 Advanced Task Killer has a variety of kill modes (Safe, Aggressive, and Crazy). We left it on the Safe setting and had it stop apps every half hour; this setting kills apps that aren’t open but still consume memory. The developer recommends the Safe setting, since the other two settings can cause some apps to become unstable. Does Advanced Task Killer Save Phone Battery Life? Battery life is expressed in hours:minutes. While the Droid Bionic saw no benefit, the AT&T Galaxy S II did worse with the task killer running--though contrary to some of the stern warnings you'll see about these apps on the Web, the decrease was almost insignificant. The Galaxy S II merely dropped from 7 hours, 22 minutes down to 7 hours, 20 minutes. With an average improvement of 1.9 percent, the impact of a task killer on phone battery life in our study was virtually unnoticeable. Task killers may be great for freeing up extra phone RAM, but if you are looking for a way to get more juice out of your handset, you’re better off shelling out the extra dough for an extended battery.